Summary: The German gossip magazine DAS GOLDENE BLATT has 2006 violated point 1 and 2 of the German Press Code. The complaint of 30. May 2005 was 27. September 2005 answered by the German national press council giving a "reprimand" see national press committee decision in German (1 Mbyte pdf file). Is there somebody out there who is willing to translate to English. I would be happy to publish the translation here. 06. Dec. 2006: Press council complaint BK2-246/06: DAS GOLDENE BLATT has violated point 1 and 2 of the German Press Code. The ruling is a reprimand according to section 12 of the Complaints procedure of the German Press Council. 16. July 2006: Why does the national press council not answer? This is a violation of the rules of the council. 29. Jan. 2006: Complaint about birth which took plave afterwords. 28. Nov. 2005: Letter to press council: "Das goldene Blatt" and other German press lies about a birth (=Geburt), which took place 3. Dec. 2005. 28. Nov. 2005: Answer of Press concil who assures that German press will respect the reprimand. 12. Nov. 2005: Unfortunately there is little publicity in Germany. Is it necessary to follow up with letters to gossip press and the press council? 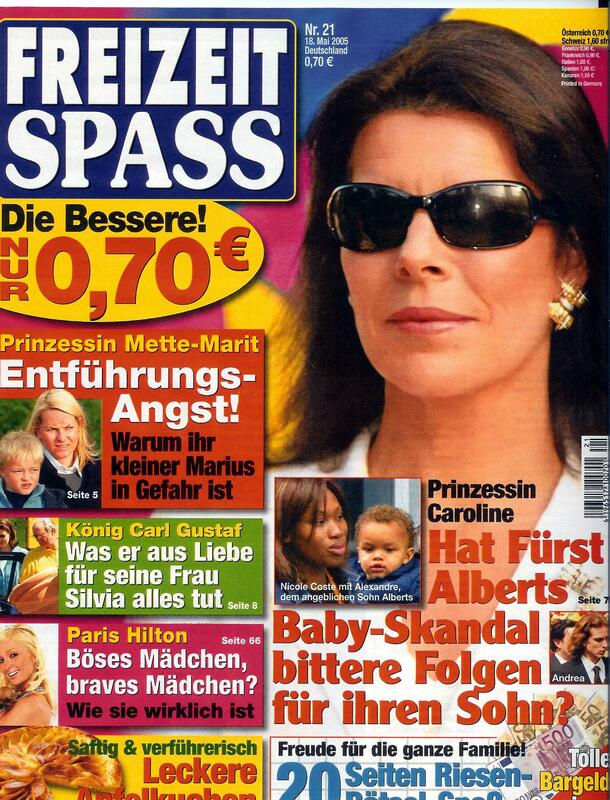 The Norwegian Crown Prince and Princess are enormously popular in Germany, and they have regularly featured in the fantasies of the glossy weeklies since 2001. The scandal press in Germany may in the year 2005 finally have gone too far in their efforts to boost sales by spinning wild tales about Norway's royal family, and now action is being weighed after inventions were printed about Marius Borg Høiby, Crown Princess Mette-Marit's son from a previous relationship. Norway's royal family have tended to ignore the German gossip weeklies despite occasionally offensive fictions, but are not likely to tolerate stories that focus on children, newspaper VG reports. Three of these magazines feature stories about eight-year-old Marius, something which has upset Crown Princess Mette-Marit and Crown Prince Haakon. "They (the royal couple) react to the clear focus on children, in this case Marius," palace information chief Astrid Versto told VG. "They will now assess what they will do about these stories." 26 May 2005: Aftenposten: Palace reacts to lies about Marius. 30 May 2005: Complaint against German scandal press. 30.05.05: Complaint against German scandal press. 05.06.05: Chefredaktør Peter Viktor Kulig gibt zu, dass die Geschichten der Fantasie entspringen, verteidigt diese Lügengeschichten doch damit, dass die Leser das wünschen und Marius das nicht liest..
07.06.05: Bestätigung des Eingangs, zusätzlich Information notwendig. 10.06.05: Folgende Texte wurden überandt (hier nur teilweise aufgeführt): die-aktuelle-Nr.21/2005, das-neue-Nr.21/2005, Frau-mit-Herz-Nr.21/2005, FREIZEIT-SPASS-Nr.21/2005 und 7 Tage. 16.06.05: Pressrat bestätigt Engegennahme der Bilder, möchte aber nähere Beschreibung der Kritik. 19.06.05: Letzter Klageteil mit genauer Begründung im Detail. 11.10.05: Es wurde eine Missbiligung ausgesprochen und die Begründung wird "in Kürze" zugesendet werden. 25.10.05: Der Presserat bittet um Ihr Verständnis für diese kleine Verzögerung. 28.11.2005: Lie in "Das goldene Blatt and "7 Tage" on birth (Tittelblatt), which first took place 3. December 2005. This was the answer to the suggestion of Germany press that the government should complain against the Caroline judgement. The German Press Council Presserat supported this critic of human rights: http://www.presserat.de/Show_Press_Release.229+M590aa95dbd0.0.html and sees a danger for press freedom: http://www.presserat.de/Show_Press_Release.229+M59a668525e5.0.html?&encryptionKey=434fdfgfh4Efdfd.